Thomas Hawley Tuberville (born September 18, 1954) is an American football coach and former player. Tuberville served as the head football coach at the University of Mississippi from 1995 to 1998, Auburn University from 1999 until 2008, Texas Tech University from 2010 to 2012 and University of Cincinnati from 2013 to 2016. 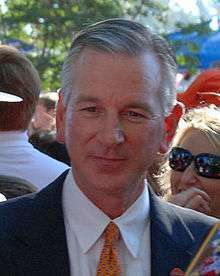 Tuberville was the 2004 recipient of the Walter Camp and Bear Bryant Coach of the Year awards after Auburn's 13–0 season, in which his team won the Southeastern Conference title and the Sugar Bowl, but was left out of the BCS National Championship Game. Tuberville earned his 100th career win on October 6, 2007, in a 35–7 victory over Vanderbilt. He is the only coach in Auburn football history to beat in-state rival Alabama six consecutive times. In 2015, Tuberville was the president of the American Football Coaches Association. Tuberville was born and raised in Camden, Arkansas, one of three children of Charles and Olive Tuberville. He graduated from Harmony Grove High School in Camden in 1972. He attended Southern Arkansas University, where he lettered in football as a safety for the Muleriders and also played two years on the golf team. He received a B.S. degree in physical education from SAU in 1976. In 2008 he was inducted into the Southern Arkansas University Sports Hall of Fame as well as the Arkansas Sports Hall of Fame. Tuberville coached at Hermitage High School in Hermitage, Arkansas to begin his career. Tuberville was an assistant coach at Arkansas State University. He then went through the ranks at the University of Miami, beginning as graduate assistant and ending as defensive coordinator in 1993 and winning the national championship three times during his tenure there (1986–1994). In 1994, Tuberville replaced Bob Davie as defensive coordinator under R. C. Slocum at Texas A&M University. The Aggies went 10–0–1 that season. Tuberville got his first collegiate head coaching job in 1994 at the University of Mississippi. Despite taking over a Rebels team under severe NCAA scholarship sanctions, he was named the SEC Coach of the Year in 1997 by the AP. During his tenure, he acquired the nickname "The Riverboat Gambler" for his aggressive play calling, particularly on fourth down. While at Ole Miss, Tuberville made the statement, "They’ll have to carry me out of here in a pine box," in reference to not leaving to coach at another school. Two days after he made that statement, it was announced that he was departing for Auburn. He left Ole Miss following the 1998 regular season to take the head coaching job at Auburn University. 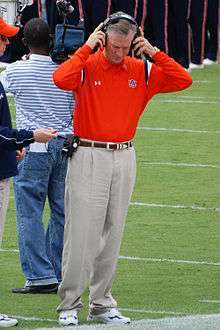 During his tenure at Auburn, Tuberville guided the Tigers to the top of the SEC standings, leading the Tigers to an SEC Championship and the Western Division title in 2004. Under his direction, the Tigers made eight consecutive bowl appearances including five New Year's Day bowl berths. In 2004, Auburn was a perfect 13–0 including the SEC title and a win over Virginia Tech in the Sugar Bowl. Tuberville received Coach of the Year awards from the Associated Press, the American Football Coaches Association, the National Sportscasters and Sportswriters Association and the Walter Camp Football Foundation. In 2005, despite losing the entire starting backfield from the unbeaten 2004 team to the first round of the NFL Draft, Tuberville led Auburn to a 9–3 record, finishing the regular season with victories over rivals Georgia and Alabama. Under Tuberville, Auburn had a winning record against its biggest rival, Alabama (7–3), and was tied with its next two most significant rivals, Georgia (5–5) and LSU (5–5). He led Auburn to six straight victories over in-state rival Alabama, the longest win streak in this rivalry since 1982, the year Auburn broke Alabama's nine-year winning streak. Tuberville also established himself as one of the best big-game coaches in college football, as his teams won nine of their last 15 games against Top-10 opponents since the start of the 2004 season. In 2006, his Tigers recorded victories over two Top-5 teams who later played in BCS bowls, including eventual BCS Champion Florida. Tuberville had a 5-2 career record versus Top-5 teams, including three wins versus Florida. However, Tuberville developed a reputation for losing games where he clearly had the better team. Examples include a humbling 24-point loss to a then 4–5 Alabama team in 2001 and a loss to Vanderbilt — the first time Auburn lost to the Commodores in over five decades—. In fact, after dropping three straight SEC games in 2003, Auburn booster Bobby Lowder, along with Auburn's president and athletic director, contacted then Louisville head coach Bobby Petrino to gauge his interest in taking the Auburn job if Tuberville was fired. The press found out about the meeting, which occurred just prior to the 2003 Alabama game, and the episode has since been referred to as "JetGate." Tuberville coached 19 players who were selected in the NFL draft, including four first-round picks in 2004, with several others signing as free agents. He coached eight All-Americans and a Thorpe Award winner (Carlos Rogers). Thirty-four players under Tuberville were named to All-SEC (First Team). Eighteen players were named All-SEC freshman. His players were named SEC player of the week 46 times. He also had two SEC players of the year and one SEC Championship game MVP. 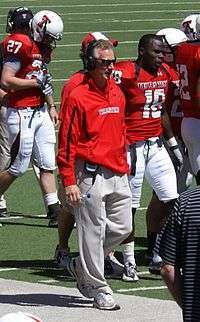 Tuberville fired offensive coordinator Tony Franklin on October 8, 2008. After the 2008 season, with a 5–7 record including losses to Vanderbilt, West Virginia, and a final 36–0 loss to Alabama, he resigned from Auburn. Auburn athletic director Jay Jacobs claimed that Tuberville voluntarily resigned. Jacobs added: "To say the least, I was a little shocked. But after three times of asking him would he change his mind, he convinced me that the best thing for him and his family and for this football program was for him to possibly take a year off and take a step back." With his departure, Tuberville was paid a pro-rated buyout of $5.1 million. The payments included $3 million within 30 days of his resignation date and the remainder within a year. Following his departure from Auburn, during the 2009 football season, Tuberville worked as an analyst for Buster Sports and ESPN, discussing the SEC and the Top 25 on various television shows and podcasts. He also made a cameo appearance in the Academy Award-winning feature film The Blind Side. On December 31, 2009, Tuberville expressed interest in becoming the head coach of the Texas Tech Red Raiders football team. The position was left open after the university fired Mike Leach. On January 9, 2010, Tuberville was named head coach and was introduced at a press conference on Sunday, January 10, 2010. On January 1, 2011, Tuberville became the second head coach in Texas Tech football history to win a bowl game in his first season—an accomplishment unmatched since DeWitt Weaver's first season in 1951-52. On January 18, 2011, Texas Tech announced that Tuberville received a one-year contract extension and a $500,000 per year raise. The extension and raise gave Tuberville a $2 million per-year salary through the 2015 season. At the beginning of Tuberville's first year at Texas Tech, season ticket sales increased from the previous record of 30,092 to 46,546. Additionally, Tuberville is responsible for the highest-rated recruiting class in Texas Tech history, securing the 18th-ranked recruiting class in 2011 according to Rivals.com and the 14th best in the country according to Scout.com. On November 10, 2012, during a game against the Kansas Jayhawks, Tuberville became involved in a dispute with graduate assistant Kevin Oliver. Tuberville touched him and knocked off both Oliver's hat and his headset. After the game, Tuberville initially explained the incident by stating that he was aiming for Oliver's shirt in an attempt to pull him off the field. Two days later in his weekly press conference Tuberville apologized, citing his desire to set a better example for his two sons, one of whom was on the team. Although Tuberville continued to run Leach's wide-open "Air Raid" spread offense, he was never really embraced by a fan base still smarting over the popular Leach's ouster. Tuberville left Texas Tech with an overall record of 20–17 and 9–17 in Big 12 conference play. On December 8, 2012, Tuberville resigned as head coach at Texas Tech in order to accept the same position at Cincinnati with a $2.2 million contract. Cincinnati's athletic director, Whit Babcock, had previously worked with Tuberville at Auburn; the two have been friends for several years. On December 9 an article in the Lubbock Avalanche-Journal pointed out that Cincinnati is only 30 miles from Guilford, Indiana, home of Tuberville's wife, Suzanne. In 2013, his first season with Cincinnati, Tuberville led the Bearcats to an overall record of 9-4 and a 6-2 conference record. His 2014 team was also 9-4 overall, but this time earned an American Athletic Conference co-championship by virtue of their 7-1 league mark. Both years also saw bowl losses, in 2013 to the North Carolina Tar Heels and 2014 to the Virginia Tech Hokies. On December 4, 2016, after a 4-8 season, Tuberville resigned as head coach of Cincinnati. Tuberville is married to Suzanne (née Fette) of Guilford, Indiana, approximately 30 miles west of the coach's job in Cincinnati, Ohio. They are the parents of two sons, Tucker and Troy. In a January 2010 interview in which Tuberville discussed various aspects of his personal outlook and his life beyond coaching, he described how he and Suzanne, both teetotalers, chanced to meet in Pat O'Brien's Hurricane Bar in the French Quarter of New Orleans. The year was 1989 when Tommy was coaching defense for the University of Miami Hurricanes and Suzanne — based in Boise, Idaho and employed by Newhouse Newspapers — was in New Orleans to work on a convention. They talked between tables for an hour, and he gave her his business card, finding her especially interesting because, although she was from a small town in Indiana, was a fan of Bobby Knight and knew a lot about basketball, she "had no clue" about football. The Hurricanes were to play in the Sugar Bowl in the Louisiana Superdome, and Suzanne did not know what the Sugar Bowl was and found that attractive. 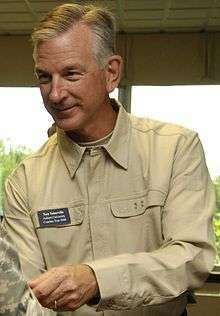 During his time at Auburn, Tuberville participated actively in the Auburn Church of Christ and contributed time and resources to other organizations within the Auburn community including Storybook Farm, an equestrian-based program offering free therapeutic care to children with debilitating illnesses and those suffering from bereavement. Additionally, he hosted charity golf tournaments for Camp ASCAA, the Girls and Boys Club of Montgomery, the Auburn University Marching Band, and the Alabama Sheriffs' Youth Ranches. Tuberville has indicated his other interests as "NASCAR, golf, football, hunting and fishing, . . . [and] America's military"; he is a director for Morale Entertainment, which provides National Collegiate Athletic Association for tours among deployed U.S. servicemembers. In 2010, Tuberville was named as a co-defendant along with John David Stroud in a lawsuit brought against TS Capital LLC. The lawsuit was filed by investors and alleged that Tuberville and Stroud co-managed a hedge fund that defrauded investors of U.S. $1.7 million. Stroud was found guilty in August 2013 of securities fraud, ordered to pay $2.1 million in restitution and serve 10 years in jail. The lawsuit against Tuberville was settled on October 10, 2013 but terms were not disclosed. 1 2 Peale, Cliff (Jan 2, 2013). "Cincinnati's Tommy Tuberville will make $2.2M". The Cincinnati Enquirer. Retrieved 3 January 2013. ↑ "Ole Miss won't forget old 'pine box' comments". Decatur Daily. October 26, 2007. ↑ "Tommy Tuberville Resigns As Head Football Coach At Auburn". AuburnTigers.com. December 3, 2008. Retrieved December 8, 2012. ↑ "Auburn AD: Tuberville's resignation a surprise". ↑ "Blue Plate Special: Tuberville on Auburn's opener | al.com". Blog.al.com. 2009-09-05. Retrieved 2010-10-12. ↑ "Ex-Auburn coach Tommy Tuberville expresses interest in Texas Tech Red Raiders job - ESPN". Sports.espn.go.com. 2009-12-31. Retrieved 2010-10-12. ↑ Harland, C. W. "Pete" (2011-03-20). "Tuberville wasn't first coach to win bowl in first Tech year". Lubbock Avalanche-Journal. p. A12. Retrieved 2011-03-27. ↑ "Football Season Ticket Sales Break Record". Texas Tech Today. 2010-08-25. Retrieved 2011-04-18. ↑ Myerberg, Paul (2012-11-10). "Tommy Tuberville gets physical with an assistant (GIF)". USA Today. Retrieved November 11, 2012. ↑ Schwab, Frank. "Tommy Tuberville says he was just trying to get assistant off the field when he yanked off his headset". Retrieved 14 December 2012. ↑ Kay, Joe (2012-12-09). "Tuberville takes Cincinnati post". Advocate. Baton Rouge. p. 5C. Retrieved 2012-12-09. ↑ Texas Tech hires Kliff Kingsbury. ESPN, 2012-12-12. ↑ Kosmider, Nick (December 8, 2012). "Tuberville leaves Texas Tech for Cincinnati". Lubbock Avalanche-Journal. Retrieved December 8, 2012. ↑ Tommy Tuberville new Cincy coach. ESPN, 2012-12-08. 1 2 Kosmidier, Nick (2012-12-09). "Cincinnati, really? : Tuberville bolts Lubbock; stuns community, team". Lubbock Avalanche-Journal. pp. A1, A9. Retrieved 2012-12-13. ↑ Tommy Tuberville interviewed by Don Williams, Coach Tuberville talks about motivation, family, more in Lubbock Avalanche-Journal, 2010 January 17, pp. A1, A11; see also a juxtaposed interview which more concerned Tuberville's philosophy of football coaching: Tuberville interviewed by Williams, Tuberville: 'I always thought I could do anything' in Lubbock Avalanche-Journal, 2010 January 17, pp. A1, A11 (both sites accessed 2010 January 25). Tuberville expressed a fondness for catfish but said that in west Texas he would adjust to steak. ↑ "Tuberville in ''Christian Chronicle''". Christianchronicle.org. 1995-08-20. Retrieved 2010-10-12. ↑ "Storybook Farm - Hope on Horseback". Story-book-farm.org. Retrieved 2008-12-04. ↑ "Cincinnati's Tommy Tuberville settles fraud lawsuit". USA Today. 2013-10-10. Wikimedia Commons has media related to Tommy Tuberville.